Choose from over 20 colors – Mimi Green webbing collars are durable, washable and made from superior quality nylon capable of withstanding over 3100 lbs of pressure. Don't sacrifice comfort, safety or style. These strong & durable dog collars come in 5 sizes and 2 widths, so you'll have no trouble finding the perfect collar. Your trendy dog will love them. 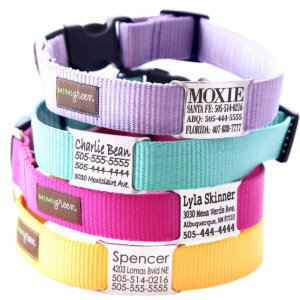 Keep in mind, EVERY Mimi Green collar can be personalized with engraving or embroidery. Reflective Dog Collar — Personalized Waterproof Dog Collar — 6 Biothane Colors! 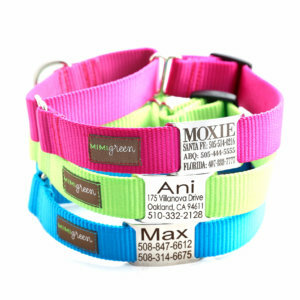 Mimi Green Fashion Webbing Dog Collars for Your Cool Dog are made especially with your trendy dog in mind. After all, your dog doesn’t have to give up comfort for style! Our nylon webbing dog collars come in 22 super cool colors, and all of them can be hand embroidered with your dog’s name, or engraved with your dog’s info right on the buckle! 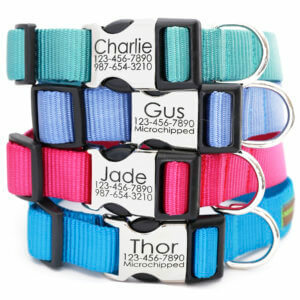 Our personalized webbing dog collars will make your dog feel so special and unique! Handmade in the USA, our collars use quality nylon webbing that can withstand over 3100 lbs of pressure! Our nylon webbing is durable and washable, so your dog’s specialty collar can remain in pristine condition. We use the finest materials and sturdy hardware to ensure the safety of your pup. Our nylon webbing collars come in 5 sizes and 2 widths, so you can find the perfect fit for your special dog!